Letter to a repentant secessionist! It’s so heart-warming that your last two letters were devoid of those strong and hate-filled words that your earlier letters were noted for! That, to me, is indeed a pleasant surprise. Then, those prayers of yours for the continued survival of Nigeria as one entity! Boy! I commend you for the courage to step away from inanities. Ndeewo! You know what? That chap, Nnamdi Kanu, just gave you an instance of what I told you all along. It is a surprise you did not realize that some gunrunners who are after blood money simply instigated some starry-eyed young Nigerian squatters in Europe to come and set their fatherland ablaze. If they had succeeded, they would simply have scrammed to one of those backwaters of Europe and leave the innocent people carrying the can. Chai! 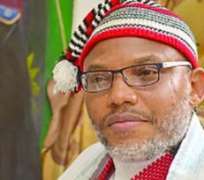 See how Nnamdi Kanu ran away fiam even before the fire he threatened had not smouldered! I am sure your wife, Amaka, and the children are in good health! What of Chinedu? Hmmm! That chap, Chinedu, will go places, I tell you. He is sorely still missed by his friends in the neighbourhood. The school principal lamented at the last PTA meeting that Chinedu’s absence is being felt by the school. In fact, the principal attributed the school’s loss at the final of the state quiz competition to Chinedu’s absence! And, you know what? The school football team is now ranked fifth in the state as there is no reliable defender to take Chinedu’s place. We all hope it will not be too long before you returned here. This is your home! I am happy you agree that we all have complaints about this country, Nigeria. No exceptions! It does not matter whether the complaint is the type that Boko Haram people are talking about. And, I think it is better, even before I address the issues you raised to remind you that EVERY soul you find in Nigeria has a grouse against the fatherland. It is only when we concede to this that we can begin to sound sensible. Right? Let’s take a quick look at the recent history of Nigeria! Frankly, it is the south west, more than any other zone, which should complain of marginalization. Forget the eight years Baba Iyabo ruled! You know the south west was home to the candidate who was denied the presidency after winning it neatly. You are right! I am talking about late Chief MKO Abiola and the June 12, 1993 election. What the south west did and why other Nigerians and indeed the whole world supported their stand was that there was NEVER a time the south west threatened to pull out of Nigeria over June 12! Never! Of course, misguided Area Boys made noises to that effect but nobody listened to them. You also recall that, as recent as during the Goodluck Jonathan presidency, there was no way any politician from the south west could have constitutionally ascended the throne in the event it became vacant. Of course, you know the south west did not feature in the top ten positions in the Jonathan government! Check the facts! And, you could not have forgotten that, with the exception of Osun state, President Goodluck Jonathan cleared all the votes in the south westPoliticians from the south west did not threaten fire and brimstone on account of being used and dumped by Jonathan! It is strange, dear friend, that one of the reasons you gave for your agitation is that the present leadership in Nigeria ‘marginalised Ndigbo’ because Igbo people do not hold high positions and are not well represented in the government! Haba! Come on, my friend, but that need not be ground for a fight in view of the experience of the south west. It is good that you eventually sat back and reflected deeply on your agitation against the backdrop of facts on the ground. Yes, there are sound reasons to grumble and people should feel free to grumble. But, it can never be okay for friends to shed blood over what we all grumble about. And, let me take you a little back in time! You could not have forgotten that a senior citizen of this great country was elected the second most powerful Nigerian nine years after the end of the civil war! Oh yes! I am referring to HE Dr. Alex Ifeanyichukwu Ekwueme who ran and won on the NPN ticket with Alhaji Shehu Shagari. That was nine years after the civil war! And this was in the genuine spirit of ‘No victor, No vanquished’! I know this fact of history is lost on many of those agitators you associated with. And I know it is difficult for you to even attempt to educate the boys for fear of being dubbed a traitor or saboteur! Now, when Dr. Alex Ekwueme occupied the number two constitutionally-recognised slot, no politician from the south west featured in the top four! You remember the senate president was Dr. Joseph Wayas while the speaker of the House of Representatives was Chief Edwin Ume Ezeoke. Yes! Chief Adisa Akinloye (you remember Adisco Champagne?) was NPN chairman. I cannot remember that anybody from the south west complained of being marginalized or foul-mouthing the fatherland or threatened to tear up the country! Tell me, dear friend! Where, exactly, is this marginalization stuff coming from? I know you detest being tagged a ‘sabo’! But, the word ‘sabo’ died in January, 1970. As you must have realized by now, the so-called saboteurs of the war years were so labelled because they were bold to speak the truth which others found distasteful. Cast your mind back, think deep and reflect on the number of times you refused to speak the truth or challenge a blatant falsehood because you feared you will suspected of being a saboteur! Now that you have freed your mind, never fall into the temptation of being anybody’s prisoner! You have finally bought the truth because it is only the truth that can save you! Henceforth, you have no cause to team up with agents of darkness because you do not have darkness in you. What you have in you, dear friend, the light of God! What is in you is the peace of God! It is not violence! Free your mind! Shun all forms of violence! Take your mind off all forms of mind-twisting substances! What you need is the spirit of God; not any man-made, mind-bending substance that only injects hate and violence into you. From this moment, dear friend, have nothing to do with hate and never let anger and violence overwhelm you. Together, we shall restructure Nigeria, our fatherland. We have to do it in peace, through negotiations and as brothers and sisters. We must reject violence; we shall not know violence in our individual homes. It is good you have now allowed your mind to begin to return to its natural state of peace! While we all await your return, I leave you with these divine words: Buy the truth and sell it not!